A while back, I said that the Gods of Theros make for terrible EDH generals. I stand by that statement and the rationale behind it. I’m here to tell you that the gods of Born of the Gods (and probably the ones of Journey into Nyx) are quite the opposite and you should respect their value, especially in foils. The ‘minor’ gods in Born of the Gods are much more flavorful than the ‘major’ gods of Theros. The five mono-color gods had a static and an activated ability. Only Purphoros and Thassa have abilities worth triggering on their own, and those are less than stellar. Thassa getting there with a Mutavault in Standard is pretty amusing in a control shell, I have to say. Our allied-color gods have only one ability, and have higher devotion requirements, but to make up for that they are much more “build around me” abilities. 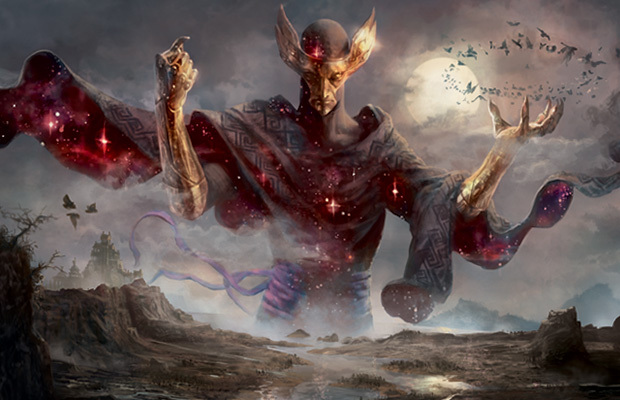 I could see myself building an EDH or casual deck around any of these legendary enchantment creatures because what they do is powerful and unique. I am an advocate of patience. I would tell you to trade away any and all cards you open at the prerelease. I have been doing that for years and it’s served me well. That being said, I can’t wait for the prices on these gods to drop to the $5 range, at which point I’d snag all I could. I doubt they will all get that low though, especially Xenagos. I’d be happy to get him at $10. My sneaky prediction is that Phenax ends up as the surprise card of the set. People love to mill! People really love to mill in lots of formats, and if you think I’m not going to work on a Doorkeeper, Wall of Frost, double Returned Phalanx, Phenax curve, you don’t know how much I love janky Standard decks. Maybe I need to add green for Prophet of Kruphix. Quick aside: I’ve told you to get your Prophets while they are cheap. They are up $1 since Inspired was spoiled as a mechanic. I’m not kidding about how good this card is in casual formats. It’s still going to get opened but if you’re looking for a safe long-term speculation, here it is. Right now, you can pre-order Phenax on TCGplayer for $8 or so. That’s a decent price point and I suspect that’s where he will be for a while yet. With Born of the Gods being labeled as a comparison to Dragon’s Maze, there may not be a lot of incentive to bust open boxes for value. Travis just this week expressed his disappointment quite eloquently, but I think that these minor gods will be casual stars for a while. Foils of Phenax will especially be in demand, and for the other gods too. EDH decks will love Karametra’s ramp into a huge Genesis Wave or some such. Mogis fits right into lots of aggressive decks AND attrition decks. Ephara plus Sacred Mesa is going to have me grinding my teeth in jealousy during four-player games. Dear lord, how many awesome haste enablers can I cram into a red/green deck? Is this timing restriction genius or what? I do wish he could target himself, but with Burning-Tree Emissary around I can see why that’s a touch too good. I don’t think there has been a card that does what Xenagos does. There have been haste-granting cards in these colors before (Fires of Yavimaya, Sarkhan Vol) but none that were indestructible. He only grants haste to one creature,, but somewhat makes up for that with the power boost. I’m looking forward to trying him as part of my mostly-creature decks, though I’m not sure if I’d rather have him or Urabrask the Hidden. So in short, if this does end up being a lightly-opened set (though it looks like a blast to draft!) then the gods will be even more valuable than their current prices indicate. I feel good comparing them to the Praetor cycle from New Phyrexia, even though that was a spring set and this is a winter. Their prices may be under $10 now, but they will creep up over time due to their casual impact.